Many times the death of a grandparent is a child's first real brush with mortality. Dealing with loss can be difficult, but at the same time, a child can grow in maturity and understanding through this experience. Answer a child’s questions, but keep your answers brief and simple. Do not feel that you must provide all the answers. Allow the child to grieve, but understand that for some children, real grief will be delayed. Listen to what the child says and how he or she says it. Don’t confuse young ones by using euphemisms for death such as rest or sleep. Reassure the child that death is not a form of punishment but is a part of life. Be sure that the child does not feel at fault. Be patient and consistent with answers if a child asks the same questions over and over. Be careful about associating death with sickness because the child may become very fearful about his or her own sicknesses. Be careful about saying that someone died because he or she was old. The child may become fearful of losing other “old” people. When possible, present a positive picture of aging to your grandchild. Opinions are divided over whether young children should attend funerals. 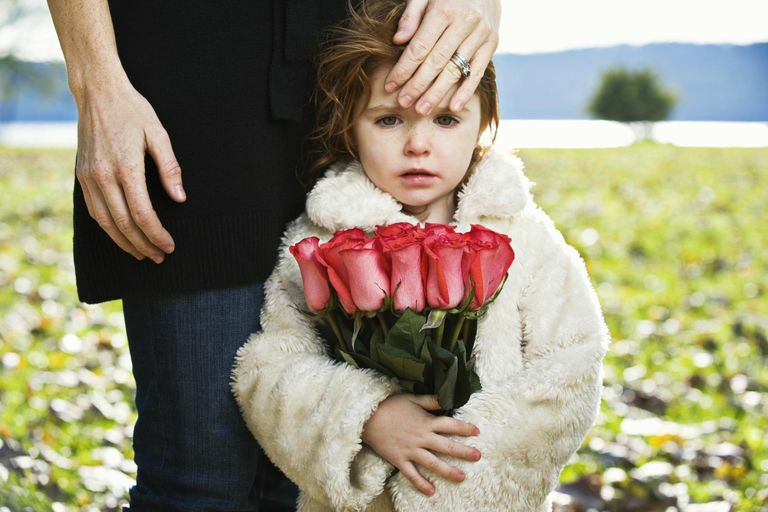 Children need to be with their families during the grief process, but funerals can be overwhelming for young children. Sometimes attending a wake or visitation can be an acceptable substitute for attending the actual funeral. If a child is going to attend a service, go over what will happen so that he or she will be prepared. If the child is going to attend a visitation or service with an open casket, let the child decide whether he or she wants to view the body. If so, arrange for it to be in the company of a calm adult. Prepare the child for the appearance of the body, saying that because the body is no longer working, it does not look the same. Allowing a child to place a picture or letter in the casket can be comforting. Prepare the child for the fact that some people at the service will be crying, but others may be laughing and talking, and that is their way of remembering the deceased. One issue that can be tricky after a death is a religion, especially for interfaith families or families with a mix of believers and non-believers. If a child has been raised in a religious household, parents will probably put death into a religious context. Grandparents should not contradict their views; that's a part of respecting boundaries. Parents who have chosen not to put the death in such a context probably will not want others to do so. Besides, to introduce new ideas about God and the afterlife at such a traumatic time can be more confusing than consoling. In both cases, if a child asks difficult questions, it’s okay simply to say that you do not have all the answers. Children who are dealing with the death of one individual often logically wonder if they will lose other people they love. Especially if you are a grandparent helping a child deal with the death of another grandparent, the child may anticipate that he or she will lose you as well. Saying something simple such as, “I expect to be here for a long time” is the best solution. Some children find comfort in the days following a death by looking at or even carrying around pictures of the loved one. A special toy or memento associated with the deceased can also be comforting. The child’s teachers or caregivers should be told about the death. A child going through the grief process may become anxious and clingy or angry and rebellious. He or she may complain of physical symptoms such as a headache or stomachache or have trouble concentrating in school. These behavioral changes will probably go away in a matter of weeks. If they do not, the child may need to talk to a counselor. It's important not to let a taboo arise around the topic of the deceased person. Don't be afraid to mention the person's name and share an occasional memory of him or her. This practice reinforces the concept that dying is a natural part of living rather than being something supernatural and scary. Also, mentioning the name of the deceased provides an opening for your grandchild to talk about the death, which can be healing. As time goes by, concentrate on providing your grandchild with a stress-free environment. Active play, humorous games and hanging out with cousins may help. Unconditional love is the best soother of all.